For CasaLuker, innovation and quality are two of its most essential ingredients. This is why, as from last year, the company started to commercialise four new types of chocolate couvertures made with Fino de Aroma cocoa together with a very special ingredient, panela, or raw sugar made from evaporated cane juice. CasaLuker decided to include in its portfolio a product that is traditional for the Colombian market but new to other markets in the world. This type of raw sugar has now been incorporated as an essential part of their new chocolate couvertures. 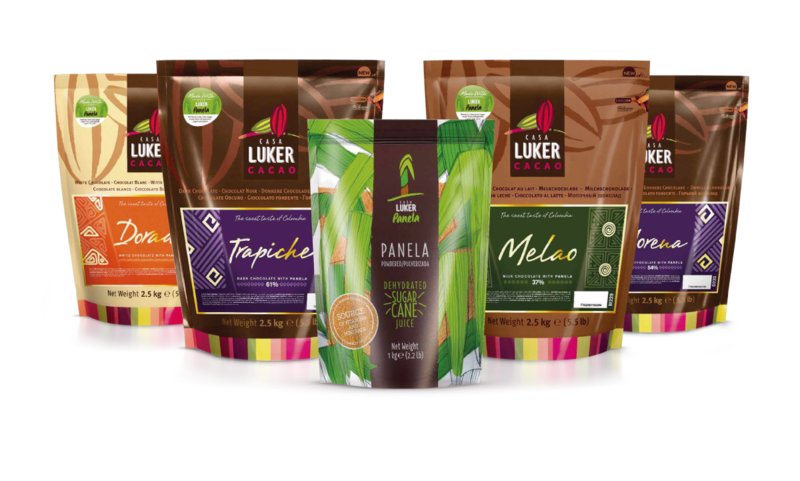 Panela is used to replace refined sugar in response to the preferences of modern consumers, whereby the added value of products is derived from their artisanal, natural, healthy and differentiated quality. The target consumers of these new products are; chocolatiers, chefs, pastry chefs, and amateurs that want to make special and original products. Dark Chocolate Trapiche: This dark chocolate has an exquisite chocolaty aroma, delicately combined with fruity notes. Its taste is a combination of unique and unmatched cocoa notes, perfectly balanced bitterness, and the typical sweet caramel notes of panela. White chocolate Dorado: The panela used in its recipe gives this white chocolate a golden hue, which makes it original and provocative. This exotic chocolate stands out for its sweet flavour and creamy milk caramel and panela notes, producing a delicate refreshing flavour.